Kalgoorlie was our final destination on our recent 4-night stint away. Approximately 600km east of Perth and 400km north of Esperance, it is set in the heart of the Western Australian Goldfields region. Gold was found in the area in the late 1890s and continues to be mined today, making the region one of the richest gold producing areas ever discovered. The district is also a huge producer of nickel. For a mining town, Kalgoorlie is big: over 30,000 people. This population sprawls between Kalgoorlie and its neighbouring town of Boulder, and officially they are one town known as Kalgoorlie-Boulder. There are schools, shops and a hospital to service the area. It might be isolated, but the region is well established! I was prepared for the size of Kalgoorlie, but was surprised by how sprawling it was. The streets are wider than any I have come across, the footpaths are just as generous, and the houses are set on huge blocks. I guess land isn't at a premium in Australia's centre. I was also surprised at the number of trees scattered throughout the town, and lining the roads leading to it. The area isn't as dry as some parts of the state, and it shows. We had two nights in Kalgoorlie, and after saving on accommodation in Hyden and Esperance, we took advantage of a discount deal to book into the Rydges Resort in South Kalgoorlie. We were then upgraded from a standard room to a one-bedroom apartment, which meant we had a huge living space adjoining the bedroom. It would have been nice to stay for a week! Kalgoorlie actually has a good selection of accommodation options, and also showcases a number of impressive buildings and hotels. It is sad to think how many of Perth's original stone and brick buildings have been lost; I think Kalgoorlie has retained roughly the same number as the whole of Perth. After taking in the town centre, we headed to the Kalgoorlie museum, which is actually an outpost of the Western Australian museum. It is very well set up, and with a recommended donation entry of $5 per adult, reasonably priced too. The displays cover the gold mining history (complete with well secured examples of gold), the development of the region over time, showcases of artifacts, and restored old buildings. I liked the attention to the social and environmental impacts of mining, and the acknowledgement that the financial rewards of gold do not counter the costs to miners' health (particularly in the early days when conditions were appalling) or the impact to the land in obtaining it. Views over Kalgoorlie - sprawling, but flat! Whilst Kalgoorlie itself is worth seeing, one of our main reasons for visiting the area was to see Lake Ballard, set approximately 2 hours further north of Kalgoorlie past the small (tiny) town of Menzies. 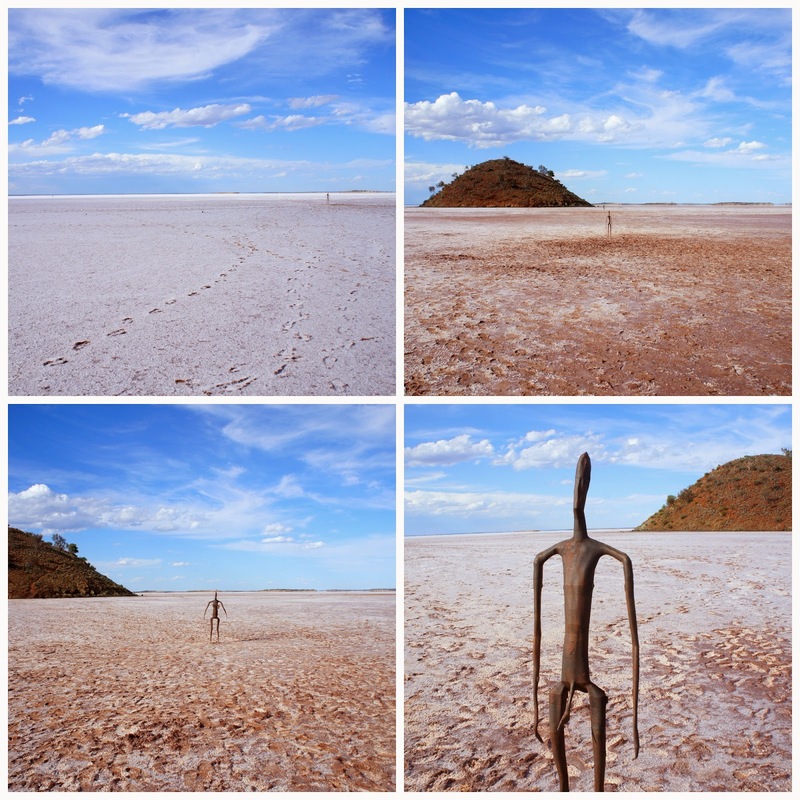 Antony Gormley, the British scultpure who created England's Angel of the North, chose Lake Ballard as the site for 51 steel sculptures he created from scans of the local Menzies residents. Titled Inside Australia, the project must have taken a huge amount of work, not just to create the sculptures but to position them around the enormous salt lake. The area is hot, sun-scorched, and a little bit eery. We were the only ones there, and to traverse the whole lake, you would need to allow at least 4 hours. We visited the sculptures closer to shore, and tried to avoid slipping over in the salt-crusted mud. It turns out salt lakes are soggy underneath the salt! Lake Ballard is incredibly isolated, but if you ever find yourself in the region, it is worth the extra travel from Kalgoorlie. We were rewarded with an emu sighting on our way back too (just visible to the left of the centre in the photo below). In terms of food, Kalgoorlie has two large supermarkets, plenty of fast food chains, and a number of local and chain cafes. It has comparatively few restaurants, but does cover the major Asian bases (Thai, Chinese, Indian, Japanese) and the hotel pubs are popular. We took advantage of our apartment 'dining room' to collect vegetarian woodfired pizza on our first night, from Sam's Pizza Bar in Boulder. They were happy to customise the order to give a cheese-free half for me. On our second night, we collected Thai from Lemongrass Thai and Vietnamese, a casual restaurant that also offered an appealing dining area with inside and outside seating options. I tried the unusual (to me) stir fried tofu and vegetables in lemon and lime sauce. Lemon and lime isn't a stir fry option I've come across before, but the citrus component was nicely balanced by sweeter flavours and the vegetables and tofu. It also delivered a decent spice punch, with just enough heat to leave my mouth tingling but not so much I was in danger of choking. It's a careful balance! Mr Bite had vegetarian hokkein noodles in black bean sauce, which he approved of, although in his case the spice level was a little too high for comfort. Still, he liked them enough to persevere and I was impressed by the inclusion of actual whole black beans within the dish. 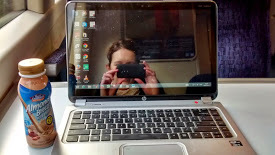 In all, we packed a lot into our mini trip, and I am really pleased to have managed it. The driving was on an enormous scale, but it was worth it! Rydges Kalgoorlie Resort and Spa is located at 21 Davidson Street, Kalgoorlie. Their website has booking options and their phone number is +61 8 9080 0800. Sam's Pizza Bar is located at 73 Burt Street in Boulder and offers a range of wood fired pizzas that can be customised on request. It is open Tuesday to Sunday and the phone number is +61 8 9093 1661. Lemongrass Thai and Vietnamese is located at 5/84-90 Brookman Street, Kalgoorlie. Their menu is uploaded to their Facebook page and they are open 7 days. Their phone number is +61 8 9201 8009. Have you seen sculptures or other art pieces that have left you a bit in awe? Wow you guys did a lot in such a short time! I love the steel sculptures. Super cool. And the mining museum also sounds fascinating! Thanks Joanne - it was surprising how much I didn't know about mining in the area given I grew up in this state! I love the angel of the north so I would love to see these sculptures - very glad to see your photos and know the artists has done some Aussie sculptures - I would be interested to see kalgoorlie but it strikes me as strange that my great grandfather travelled out from the UK and across Australia to Kalgoorlie (or around there) for mining and then to Melbourne, whereas the trip to Kalgoorlie sounds even more difficult than going by plane to Scotland for me. Also interested to know where tourists come from to kalgoorlie - wondered if there were a lot of Asians and that would explain the eating options - or are there many uk/european backpackers? Your great-grandfather's journey does sound like a huge effort, especially at that time. I don't even know how one got from Melbourne to Kalgoorlie back then - possibly train, as I know the road across the centre wasn't sealed. A big effort (I hope he found some gold?!). I was surprised at how few Asian tourists there were through all the places we visited. I'm used to that demographic being a big part of our tourism industry but the people we saw were all Australian or European - I suspect a number of backpackers like you refer to. Also, I think a third of the population of Kalgoorlie are miners so perhaps take away and hotel/pub food caters to that demographic too. More gorgeous photos - I am loving coming with you on your trip. You really did pack a lot in! The variety of landscape in Australia never ceases to amaze me. Incredible that you've got that beautiful sparkling sea and those dry deserts. I went to a gold museum in Colombia many moons ago and found it really interesting. Your comment sums up the landscape contrast perfectly - sparkling sea to dry deserts is the country in a nutshell :-) It's probably not surprising that most people cluster around the sparkling sea! I would love to visit Colombia one day - what a great place to visit a gold museum. If we'd had longer, we definitely would have swum :) And it is a surprisingly impressive town - as you say, impressive architecture for somewhere so isolated! I'd love to go to Kalgoorie too. It would be very exciting. You must have had a lovely trip. .you can purchase Healthgenie product and get affective discount.